Register and order online. Add graphics and install. Profit every time! YOU CAN SELL MORE SIGNS! Offer your customers great looking and affordable VersaTech2 signs and get them done fast! VersaTech2 signs are easy to sell because they provide the high-end architectural look without the high-end price, and they are perfect for a multitude of signage applications. 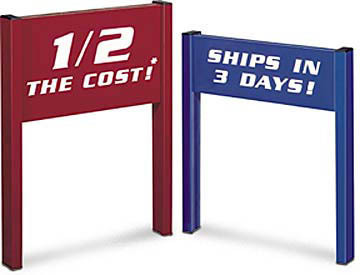 VersaTech2 signs ship in 3 days or less, so you can complete jobs faster. YOU CAN ORDER YOUR VERSATECH TODAY! Get started TODAY with just a few clicks. Click here to register and get started! VersaTech2 © 2018. All Rights Reserved.